This vegan soap is part of Soap & Pamper’s natural vegan skin care range. It is made with all natural ingredients in Devon and scented with Vetivert, Cedarwood & Bergamot essential oils. Essential oils : Essential oils: Vetivert (Vetiveria Zizanoides), Cedarwood (Cedrus Atlanticus), Bergamot (Citrus Bergamia), Turmeric for colouring, Limonene* & Linalool*. This beautifully rich smelling soap is part of Soap Pamper’s natural vegan skin care range. It will help bring your mind and thoughts back to earth. Vetivert essential oil is a deeply relaxing oil that is great for those who ‘live in the clouds’ or have experienced some kind of shock. In India this oil is known as the ‘oil of tranquillity’, which I think says it all! Cedarwood has a warm woody smell which goes well with Vetivert and Bergamot. Overall they provide a rich relaxing experience. Unless otherwise stated, all of my soaps have a minimum weight of 65g. As I cut them by hand they are usually much larger! The essential oils used in this soap are great for shaving too!! 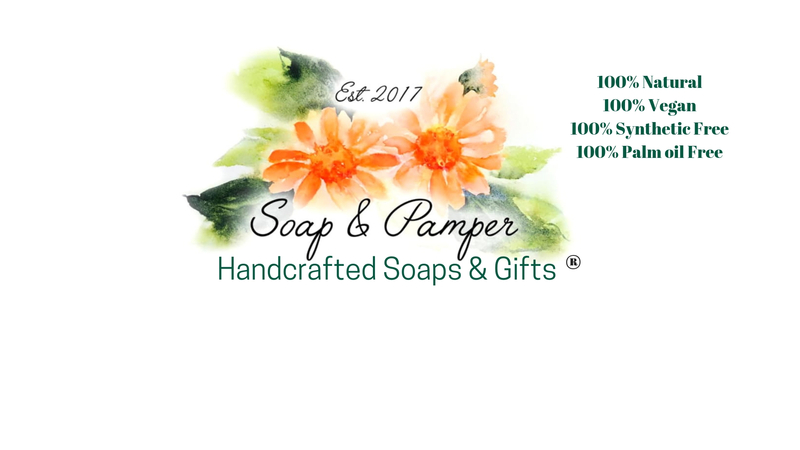 Vetivert, Cedarwood and Bergamot Soap can also be found in a gift set or gift basket.